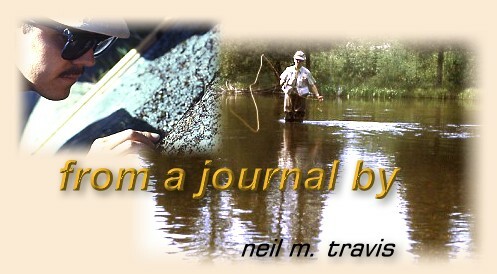 I presume most of my readers have never heard of Ray Ovington and his book Tactics On Trout that was published in 1969. It's a rather impressive tome, 286 pages plus two appendixes and index. The jacket contains the following description of what the book contains: "This uniquely concrete book teaches the angler how to 'read' trout water and, with the help of numerous precise procedural drawings, exactly how to wade, cast, and fish out each of 33 different, but typical, kinds of trout pools." That's a rather ambitious, and perhaps a somewhat presumptuous assertion; however Mr. Orvington does a rather admirable job of taking the mystery out reading trout water. The volume I have in my library cost a princely sum of eight dollars and ninety-five cents, and while it's unlikely you can find one for that price today it might be possible to find a copy in a used bookstore. While Mr. Ovingston's book is a detailed approach to various types of trout water as a practical matter it is a bit over the top. Reading trout water is not as complicated as this book would indicate, and fishing by the numbers is seldom very successful or satisfying. From the trout angler's perspective trout need two things: food and cover. The ideal spot has both of these characteristics, but trout will move from cover to find food. First let's examine what constitutes cover from a trout's perspective. Some forms of cover are obvious. Undercut banks, weed beds, partially submerged logs, and overhanging brush all are obvious places for a trout to seek shelter, but trout also utilize other forms of cover. Trout will often use relatively shallow water in riffle areas or white water runs. The broken surface of the water makes it difficult for aerial predators and anglers to detect their presence. Trout also seek cover in deep holes or runs. An ideal situation from a trout's perspective is a shallow area that tapers into a deep hole. During periods when they are not actively feeding they can hang out in the deeper water, and then move up into the shallower water to feed. If danger should threaten they can quickly move back into the security of the deeper water. The angler should realize that trout will rarely linger for very long in areas of heavy flows unless those flows are broken by rocks, logs or other in stream structures. A trout cannot afford to expend the energy necessary to constantly fight the current in such areas, and will generally only spend a short period of time in such locations when chasing some food form or when moving from one location to another. If you observe trout in areas of heavy flows you will notice that they hold behind rocks or other structures that break the current, or very close to the bottom where friction decreases the force of the flow. The angler needs to recognize where trout find cover so as to avoid spooking the fish from those areas. I have watched anglers walking along the edge of a stream that had undercut banks and overhanging grass and brush and spook every trout in that entire stretch of stream. Careless wading through riffles may chase all the fish into deeper water and ruin any chances that the angler might have had to fish to those fish. In heavily fished waters the trout may recover relatively quickly from being spooked by the careless angler, but in situations where the trout do not see lots of anglers a spooked trout is a trout that the angler will not see for the rest of the day. Trout select feeding stations based on a series of factors. High on the list are locations where the trout does not have to expend much energy to fill his stomach. Favored areas are just below riffles where the current smooths out, current seams where a faster flow encounters a slower flowing section of water, slower flowing areas immediately adjacent to the bank, immediately behind a rock or other obstruction in the current, and the tails of long pools. The angler should look for places where the currents concentrate food items in a relatively narrow area. When trout move from cover to a more exposed area to feed they tend to be more inclined to flee back to cover if they perceive any type of threat. Since attack usually comes from above the sudden appearance of an angler on the bank, a large bird flying overhead, or the flash of a rod or fly line are usually enough to send them fleeing. Trout feeding in shallow water are most vulnerable and tend to be the most skittish.